Customer experience is the way to go in today’s highly complex market landscape. It is important to invest in understanding the consumer insights and sentiments. 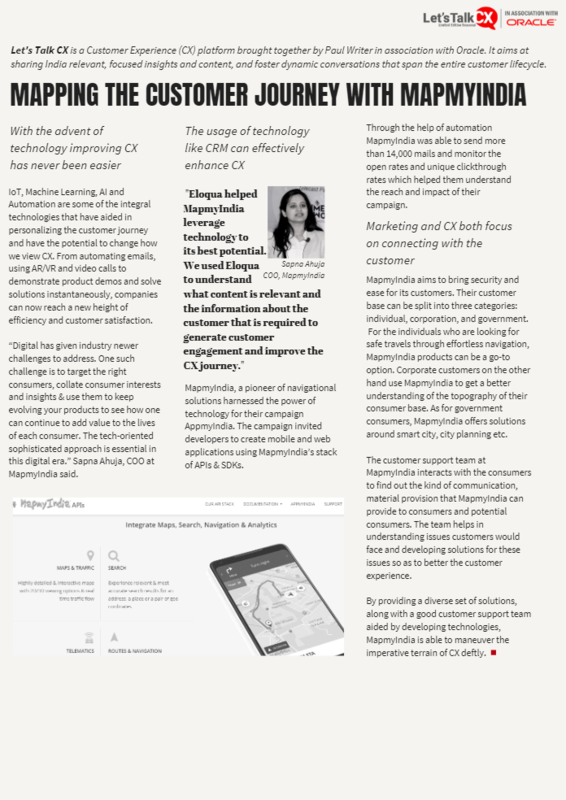 Sapna Ahuja, COO MapmyIndia, shares her insights on “Let’s Talk CX” a customer experience platform brought together by Paul Writer in association with Oracle. With Advent of technology improving CX is becoming better and easier and the need is growing. The challenge is to target the right customer with the right content, collate customer insights and leverage on it in the right way. “A tech-oriented sophisticated approach which would be a combination of marketing technology stack for CX that would include tools & platform, metrics, customer feedback, quick resolution and personal touch is essential in this digital era, informed Sapna”. Oracle’s Eloqua helped MapmyIndia leverage technology for its campaigns and for product promotion and awareness like AppmyIndia, School bus solution, and APIs. “The highly technical and sophisticated approach was successfully used in AppmyIndia campaign for developers to use MapmyIndia’s APIs and SDKs to create mobile and web applications. The open and click-through rates helped to assess the impact and reach of the campaign”. It helped to generate customer engagement and improve the customer experience. MapmyIndia is a technology-driven company developing disruptive solutions for Individuals, governance, and businesses for over 22 years. It aims to reach across its entire customer base and provide security and ease to help understand their issues and develop solutions. For a consumer-driven and customer oriented company like MapmyIndia, marketing and CX is a crucial part and adoption of new technologies would lead to develop right strategies, enhance CX, strengthen customer relationship and scale up business growth.